Claire grew up in a large military family. As a result of her father being a Navy pilot, Claire spent her childhood traveling extensively. She has lived in eight different states and spent three years in Sicily, Italy. Claire completed her Bachelor of Science in Business Administration at Franciscan University of Steubenville, Ohio in 2012. During her undergraduate education, Claire became interested in studying the law from two of her business law professors whose passion for assisting others through the law inspired her. She moved to Naples, Florida in the Fall of 2012 to attend Ave Maria School of Law. 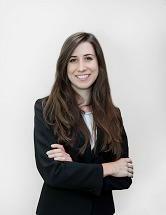 During law school, Claire interned with the GAL Program in Collier County, Florida, obtained a judicial internship with the Honorable Sheri Polster Chappell, Federal District Court Judge at the United States District Court for the Middle District of Florida, and served on the Executive Board as an Executive Editor for her Law Review. After graduating from Ave Maria School of Law in May 2015, Claire sat for the Virginia Bar Exam in July 2015 and was admitted to the Virginia Bar. Claire joined Tobias Law, P.L.L.C. as an associate attorney on December 1, 2015 which became Dougherty Tobias Iszard, Northern Virginia Law, P.C. on November 1, 2017. Claire's practice focuses primarily on family law.